We’re excited to publish a new Farmer Profile of an inspiring beginning farmer every few weeks on the NYFC blog to help showcase the breadth and vision of the next generation of agricultural leaders. 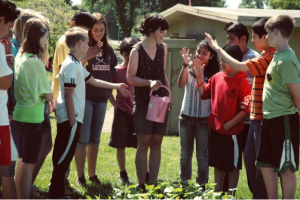 I’m Courtney Leeds, cofounder & director of Schoolyard Farms, a one acre urban farm in the schoolyard of Candy Lane Elementary in Milwaukie, OR. When I began farming, I felt my work had meaning – that I was contributing to something greater than myself -for the first time in my life. That first summer, WWOOFing on a homestead in southwest Oregon, I fell in love and never looked back. Since that summer in 2009, I have worked with inspiring urban-ag pioneers, Little City Gardens, in San Francisco, peri-urban farmers in Chico, CA, indigenous farmers in Peru and the exemplary Zenger Farm in Portland, OR. When I finished my apprenticeship with Zenger Farm in the fall of 2011, I was ready to forge my own way. When land serendipitously became available at a local elementary school at the same moment, Schoolyard Farms was born. Our mission at Schoolyard Farms is to create healthier communities by teaching kids to grow nutritious food that goes from their schoolyard to their plate. 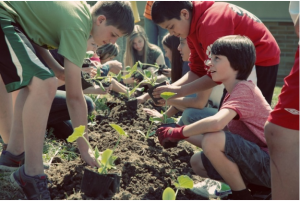 We do this by transforming underutilized schoolyards into mini-production farms and then use the farm as a classroom to teach kids where food comes from, how to grow it and give context to what they are learning in the classroom. 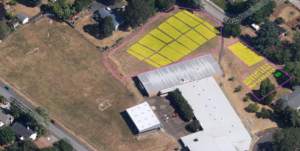 We have spent the last two years laying the groundwork to make this vision a reality in Milwaukie, Oregon: We have cultivated our first one acre farm at Candy Lane Elementary, sold thousands of pounds of produce to our community through CSA shares, farmers markets and to Head Start, designed and taught garden-based curriculum to over 300 students, built our community’s support and a board of directors. This season, we will be expanding from 17 CSA members to 30, selling the produce to the school cafeteria, constructing an outdoor kitchen and classroom and hosting Farm Summer Camp for 1st-6th graders. We farm primarily for CSA members, therefore we grow over 40 types of vegetables and several varieties of each. I am the Farm Manager in addition to Director of Schoolyard Farms and I work with volunteers and interns to maintain our one acre urban farm. Due to our size, we have decided against Organic certification because it is prohibitively expensive, but we are vigilant about farming sustainably. We do almost everything by hand and till very minimally. We try to save as much seed as possible and rely on thrift and resourcefulness to obtain our inputs and supplies. Our goal is to model sustainable farming practices that our students and neighbors can learn from and replicate in their yards. Childhood obesity is at an all-time high and, yet, children are going hungry. Schoolyard Farms gives children the skills and knowledge to grow their own food, increasing their food security. We also help them develop healthy eating habits by fostering their relationship with fresh, locally grown food. School gardens are infinitely beneficial, yet, up to this point, mostly unsustainable. By scaling up our model from a school garden to a school farm, we are able to sell the produce and sustain our program. Our vision is to replicate our model and one day see a farm on every schoolyard. You can learn more about us on our website, or these great articles from Civil Eats or 105.1.